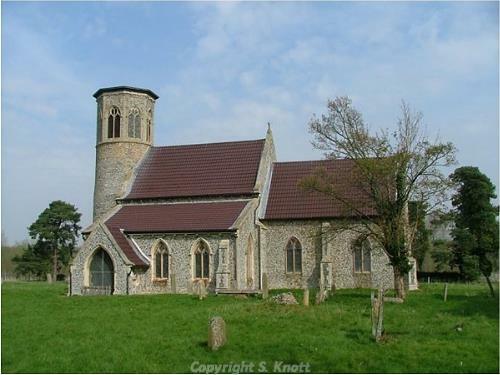 The parish of Stanford is situated in the Breckland district of Norfolk. It lies northeast of Lynford, west of Sturston and Tottington and south of Ickburgh. The name Stanford may derive from the Old English meaning ‘stony ford’. The parish has a long history and was well established by the time of the Norman Conquest. Its population, land ownership and productive resources were detailed in the Domesday Book of 1086. This document revealed that Roger Bigot held the lands here after the Conquest. It also mentioned the presence of a mill in the parish and listed various agricultural resources including numerous sheep. The village became deserted when it was taken over by the British Army during the World War Two as part of the Stanford Battle Area, an infantry training area that is still in use today. The village and most of the parish are within a prohibited area and access is not allowed without special permission from the Army. Stanford has a great deal of prehistoric archaeology, both in terms of sites and finds. The Icknield Way (NHER 1398), a possible prehistoric trackway that is thought to have linked Norfolk to southern England, runs through the parish. A hugely important Middle Palaeolithic site (NHER 37095) centred in adjacent Lynford, also stretches into Stanford. Work here in 2002 recorded a palaeochannel containing in situ mammoth remains and associated Mousterian stone tools and debitage. Other possible prehistoric occupation areas have been identified from flint pot boiler scatters (NHER 5087 and 28107). Several Neolithic sites are also on record, including a possible flint mine (NHER 5086) and flint-working site (NHER 35165) – both of which had large assemblages of contemporary flint tools. During the Bronze Age, the flint-working site (NHER 35165) established in the Neolithic period continued to operate, evidenced by the quantity of flint tools dating to this era. Additionally, a large Bronze Age bowl barrow has been identified. This barrow, known locally as ‘The Mount’, survives in good condition under a thick covering of grass. A couple of Bronze Age objects have been recovered from scattered locations across the parish of which the most significant comprises a sword blade fragment. Several Late Bronze Age pottery sherds (NHER 2725) have also been retrieved from the Rifle Range located within the Prince Albert Plantation. By the Iron Age period a settlement had sprung up in Stanford. This was located on the site previously used in the Neolithic/Bronze Age for flint working (NHER 35165). Evidence for this settlement took the form of post holes, traces of four-post structures, pits, a possible midden and several ditches. In spite of this settlement, the only Iron Age finds to have been discovered away from the settlement site are a few random pottery sherds (NHER 5087 and 35825). There is little evidence for a Roman presence in Stanford. A possible Roman road (NHER 5072) has been identified near to the southwestern parish boundary, but it is hard to corroborate this date. Metal detecting has recovered Roman coins from three locations within Stanford (NHER 2724, 5088 and 5089) but the only other find comprises a couple of pottery sherds (NHER 2725) found in 1934. The Saxon period in Stanford is very poorly represented. All Saints’ parish church (NHER 2720) has a round tower, which may be of Saxon date. Of course, it is also possible that this tower is of Norman date. The only Saxon finds consist of pottery sherds (NHER 35825) found in 2000-01 by the Rapid Identification Survey. All Saints’ Church (NHER 2720) in Stanford has a round tower, giving it a Late Saxon/early medieval origin. The majority of the church fabric dates to the 14th century but it was subject to heavy rebuilding during the 19th century, as evidenced by the nave roof. As it stands in the Ministry of Defence Training Area the roofs of the church are clad in steel, which has been cut to resemble pantiles. To the north of the church lie the remnants of the medieval village of Stanford (NHER 14447). Here, a square embanked enclosure has been noted along with other earthworks to the north and a hollow way to the east. These probably relate to the settlement mentioned in the Domesday Book, which was abandoned at some time during the medieval era. Another deserted medieval settlement has been identified in the parish. The village of Buckenham Tofts (NHER 5146), recorded in the Domesday Book and the Nomina Villorum, was also known as Buckenham Parva. The parish church of the village was dedicated to St Andrew but virtually no traces of this building or indeed any of the village buildings survive. This is because their remnants were obliterated in the 18th/19th century. The site of the former Buckenham Tofts Hall (NHER 5151) lies just a short distance southwest of the village site. Only a few medieval finds have been reported for Stanford, and most of these take the form of pottery sherds (NHER 35825 and 31918). However, a copper alloy seal matrix was recovered from an unknown location within the parish at some time in the past (NHER 12318). Many of the fine post medieval buildings in Stanford no longer exist. A prime example of this is Buckenham Tofts Hall (NHER 5151), which was built in the late 17th century. It was rebuilt in the 18th century and images show that the Hall had seven bays and three storeys, with a solid porch located in the central bay. A three-bay block of stables with a cupola was erected in 1803 for the use of the 10th Lord Petre, who was the owner at this time. The Hall was demolished in about 1950 and in around 1980 the stables were also demolished, leaving only a single-storey and loft range of white brick to the north. The Hall also had an associated park (NHER 30497). These 17th century formal gardens were fairly extensive and included an ornamental canal. By the late 18th century the area of the park has expanded, and was planted with belts and small plantations, and this expansion continued into the 19th century. Some 17th century garden walls and the earthworks of a 19th century Italianate garden with terraces are the only real survivors of this grand park. Another example of a demolished building is the former farmhouse at Bagmore Farm (NHER 16883). This building was erected in the late 16th/early 17th century and was of considerable size. However, The Mount (NHER 29182), a former lodge to Buckenham Tofts Farm, does survive. This property dates to around 1810 and has a flint exterior with brick detailing and Gothic windows. The archaeological records for the parish also show that a watermill (NHER 15247) was in operation during the post medieval period. The mill no longer survives but a 19th century brick and flint outbuilding was converted into a Scout hut in the late 1970s. Intriguingly, the millstone has been squared off and set into the riverbank as a step. Surprisingly, only one military site of World War One or World War Two date has been identified in Stanford. Perhaps one would expect rather more to survive in an area used so extensively by the military during the modern era. The site in question is a World War Two decoy airfield with two concrete bunkers (NHER 29539), which ceased to operate in 1945. By the year 2000 the army were considering removing the bunkers – whether this was carried out remains unknown. http://en.wikipedia.org/wiki/Stanford%2C_Norfolk. Accessed: 21st June 2007.